P.C.M. 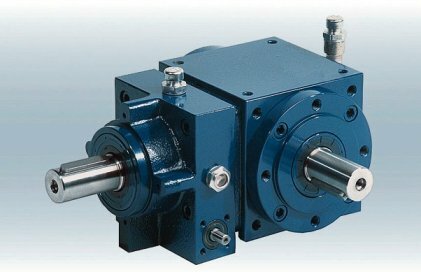 's FR series phasers are based on the principle of the epicyclic gearboxes, with the exception that the outer crown is not integral to the body but is coupled to an endless screw. By turning this screw, called correction, it is possible to increase or decrease the output speed while keeping the input speed unaltered, or rather to change the reciprocal positions between the input and output shafts. For this reason, the phasers find extensive application in all those areas where it is necessary to maintain a synchrony or a movement timing between the different stages of a machining. Plants for paper and cellulose processing. Transport tapes or power lines. The boxes are made of mechanical cast iron, machined on all exterior faces and painted entirely with oil-resistant paint. Helical conical gears are manufactured in alloy steel, cut with the GLEASON spiroid system, cemented, hardened and lapped in pairs on the ideal generator. The shafts are made of hardened steel, rectified in every part. The worm screw assembly / helical crown is irreversible. The worm is made of 18NiCrMo5, hardened and rectified. The helix crown, internally and externally, is made of 41CrAlMo7 and treated with SULFINUZ to improve performance in terms of fatigue strength and surface hardness, and also obtain a low coefficient of friction between the parts in contact and a high effect anti-seizure.